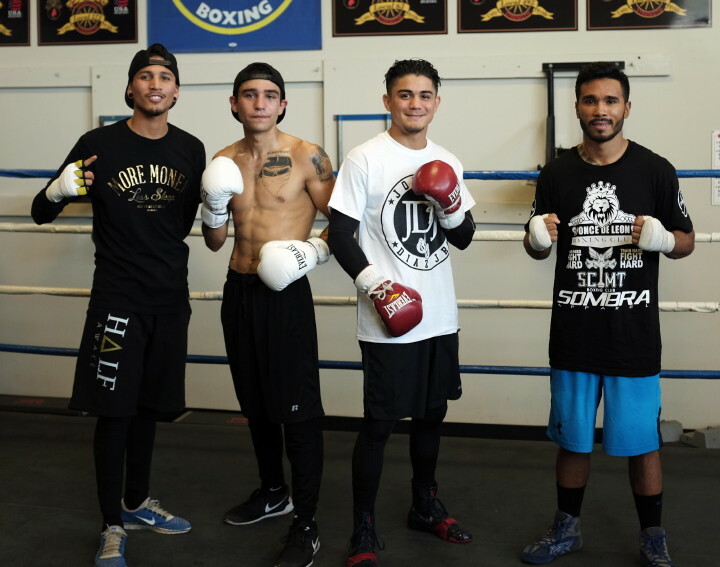 (Photo Credit: Golden Boy Promotions) SOUTH EL MONTE, Calif. (July 26, 2016) – As the summer heat hits its peak, Golden Boy Promotions fighters undefeated NABF Featherweight Champion Joseph “Jojo” Diaz, Jr. (20-0, 11 KOs), super featherweight prospect Nick “La Calavera” Arce (8-0-0, 6 KOs), and super bantamweight prospect Roy “Pitbull” Tapia (11-1-2, 6 KOs) held a media workout for their upcoming headlining fights at Fantasy Springs Resort Casino on Saturday, July 30. Jiaro Hernandez (15-9, 8 KOs) of Torreon, Mexico, who is now training out of Los Angeles, was also in attendance with former world champion Daniel Ponce De Leon ahead of his scheduled fight against Roy Tapia. NABF Featherweight Champion Joseph “Jojo” Diaz, Jr. will put his title and his undefeated record on the line in a 10-round fight against Victor “Pitufo” Proa (28-1-2, 21 KOs) of Monterrey, Nuevo Leon, Mexico. The main event of the night features number one rated contender by the WBC, “Relentless” Antonio Orozco (24-0, 16 KOs) taking on Abner “Jaeger” Lopez (25-5, 19 KOs), of Tijuana, Baja California, Mexico in a 10-round super lightweight fight. The event will be televised live by HBO Latino® Boxing beginning at 11:15 p.m. (live ET/tape-delayed PT). Tickets are moving fast for this event, with just a limited number of tickets left available for purchase. “I’m training a lot harder at this fight. I’m training with a lot more authority and have been working on landing my shots. While I’m a southpaw and he’s an orthodox, he’s very heavy handed and I know what I have to do to go in there to break him down. “It’s great to be back fighting at Fantasy Springs, and see all my fans from the desert. “I have been feeling very good for this fight. I understand the fighter I have ahead of me and have made sure to train very hard for this fight. “Growing up as a kid I did many tournaments at Fantasy Springs Resort Casino, and I feel at home fighting there. It feels like a mini arena, it has a great vibe. “I have prepared myself physically and mentally for the fight and my only goal is to stay focused on one thing–winning. “I have come to fight with a heart, like a Mexican warrior. “I firstly want to thank God, as well as my team for giving me this opportunity to show the boxing world what I have. Antonio Orozco vs. Abner Lopez is a 10-round welterweight bout, presented by Golden Boy Promotions and sponsored by “Tecate, BORN BOLD,” Casa Mexico Tequila and Carmelita Coconut Water. Doors open at 5:00 p.m. PT and the first fight begins at 5:10 p.m. PT. The HBO Latino® Boxing telecast begins at 11:10 p.m. (live ET/tape-delayed PT). Limited tickets at the $25 level are still available for purchase at the Fantasy Springs Box Office, by calling (800) 827-2946 or online at www.fantasyspringsresort.com. All floor seats are now sold out.